What are the Advantages and Disadvantages of SSHDs? Solid state hybrid drives, or SSHDs, are a blending of the traditional hard drive and the new solid state drive technologies. If you have been looking at upgrading your hard drive for a laptop or desktop computer, you may have come across the term SSHD. This is a new marketing term that was coined by Seagate to essentially label what had previously been referred to as hybrid hard drives. This new term can lead to confusion in the market as buyers can mistake these for full solid-state drives (referred to as SSDs). The tagline from Seagate for their SSHD lineup is "SSD Performance. HDD Capacity. Affordable Price." This is an attempt to communicate that these new drives will offer all the benefits of the two technologies without any real significant cost increases; however, these drives are simply traditional hard drives that add a small capacity solid state drive to the drive's controller that behaves like an additional cache for frequently used files, allowing those files to be accessed more quickly because they are stored in the solid-state drive rather than the physical hard drive. It is not all that different from taking a standard hard drive to be the primary storage of a computer system and adding a small solid state drive as a cache through a system like Intel's Smart Response Technology. Let's examine the claims regarding capacity first. 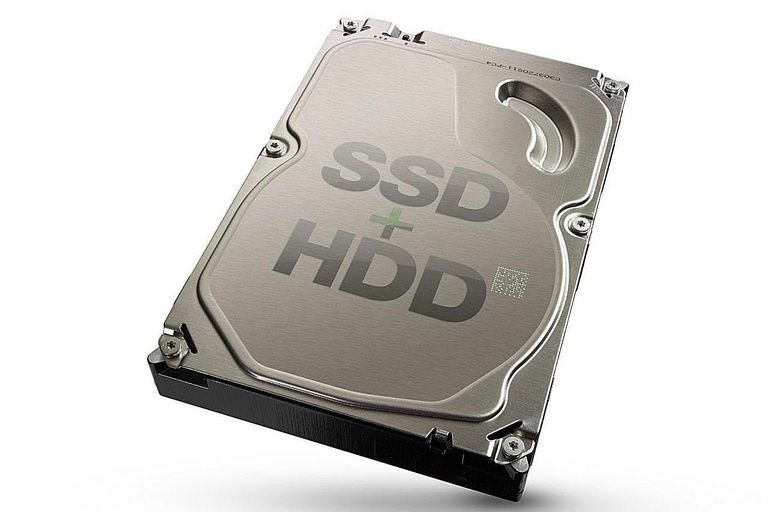 Since an SSHD is essentially the same as a traditional hard drive but with the additional space inside of the drive to hold the solid state cache, it is no surprise that the SSHD has roughly the same capacity as traditional hard drives. In fact, the laptop and desktop variants of these drives have the exact same capacities. So this claim is entirely true. Next, we compare the prices of the SSHD to the other two. In terms of capacity ratings, the SSHD does cost slightly more than a traditional hard drive because of the addition of the more expensive solid-state cache memory and additional firmware to control the caching processor. The prices range from about 10 to 20 percent more than a traditional hard drive. The SSHD is far cheaper than a full solid state drive. For the capacities, an SSD will cost anywhere from five to about twenty times the cost of an SSHD. The reason for this wide price disparity is that the higher capacity solid state drives require much more expensive NAND memory chips. The real test of a solid state hybrid drive is in its performance compared to traditional hard drives and solid-state drives. An important factor to keep in mind is that performance is highly dependent on how a computer system is used. SSHD performance will also be highly dependent upon the amount of solid state memory that is used for the cache. SSHD drives may have 8GB of this solid-state cache, which is a small amount that can be filled up quickly, requiring the frequent purging of the cached data by the system. As a result, the people who will see the greatest benefit from these drives are those who use their computer with a limited number of applications, such as a person who uses their PC only to browse the web, read and send emails and maybe use a couple of productivity applications. A gamer who plays a wide variety of PC games is not going to see the same benefits as it takes multiple uses of the same files for the caching system to determine which files to store there. If files aren't used repeatedly, the solid state cache benefit is limited. Boot times are an excellent example of how things can be improved with a standard system. The improvement will not match a full solid state drive, but it can offer an increased boot up speed over traditional hard drives. Beyond boot up speeds, improvements definitely are much more variable. For instance, if you are copying a large amount of data (for instance using it to back up another drive), the cache will quickly be overloaded and the drive will essentially perform the same level as a normal hard drive but likely less than a high-performance hard drive model. Who Should Consider an SSHD? The primary market for a solid state hybrid drive is laptop computers. The limited space on these systems generally prevents more than a single drive from being installed within them. A solid-state drive may provide lots of performance, but their generally smaller sizes limit the amount of data that can be stored on them, and their prices increase significantly the larger the SSD capacity. On the other hand, a traditional hard drive has lots of space but doesn't perform as well. An SSHD can offer an easy and affordable way to moderately improve performance without sacrificing storage capacity for anyone who might want to upgrade an existing laptop system or compromise between the two extremes in a brand new system. While there are desktop SSHDs available, we generally would not recommend them. The reason is that desktop systems, including many small and slim designs, have the space to hold multiple drives. For these systems, a combination of a small solid state drive with a traditional hard drive would likely provide greater performance improvements with only a slightly higher cost over an SSHD. This is especially true for any system that has the ability to use the Intel Smart Response Technology. The exception here is those mini desktop PCs that only have the space to fit a single mobile size drive; these can benefit in the same way as a laptop from an SSHD.